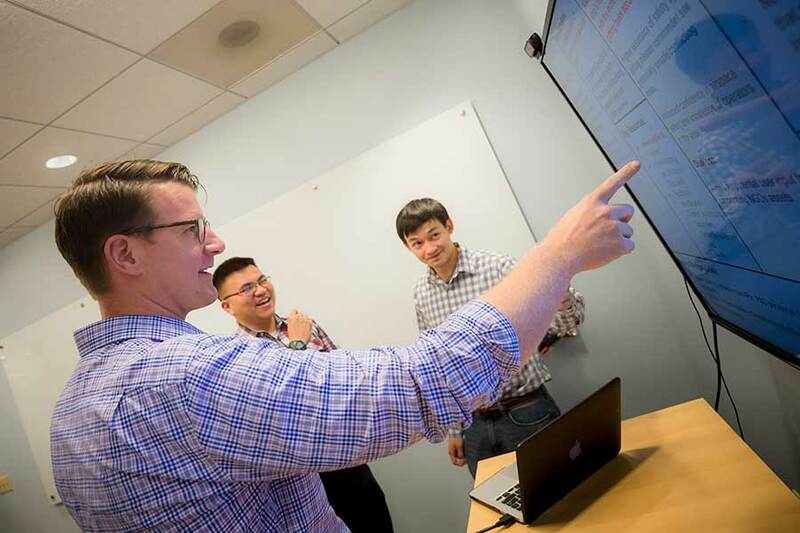 A new program at UC San Diego called Hacking for Defense gives students opportunities to leverage the culture of rapid innovation to address national security challenges. UC San Diego students worked in teams on real-world problems identified by the U.S. Navy: humanitarian assistance involving robots and defense against underwater vehicle swarms. San Diego has one of the largest and most robust military communities in the country. Combine that with the growing tech and startup sector, and Hacking for Defense is a great platform for connecting the innovation ecosystem at UC San Diego with the big challenges engaging the different aspects of the San Diego technology and innovation system. Not only does the class provide military stakeholders with potential solutions to some of their most pressing challenges, it is also designed to get students excited about solving problems that are much bigger than themselves. In a pilot for the program that wrapped up this month, the humanitarian assistance team came up with a way to distinguish robots that are friends from those that are protagonists in crisis situations. They are already seeing ways their solution could be deployed. 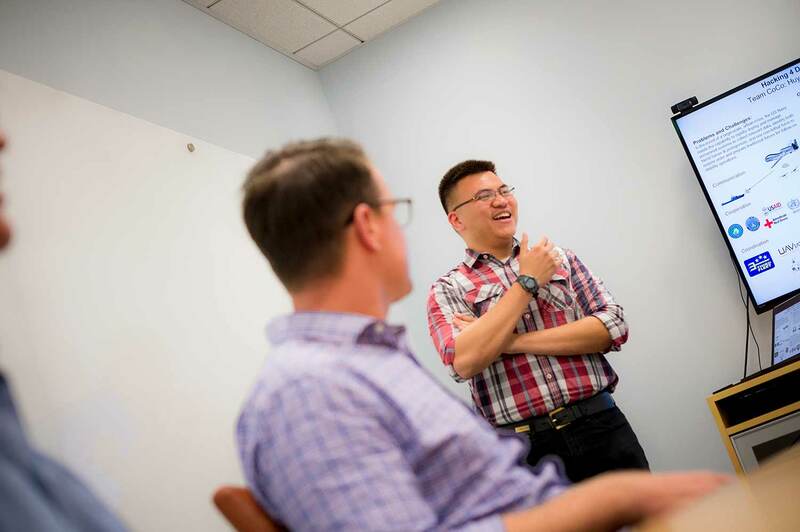 Hacking for Defense mentor Justin Wells, second-year student at the Rady School of Management and former Navy helicopter pilot, helps the students refine their mission model canvas. Hacking for Defense was originally launched at Stanford, and UC San Diego is the second institution to implement the program. The program is run by the Jacobs School of Engineering and is part of the UC San Diego Institute for the Global Entrepreneur, a joint collaboration between the Jacobs School and Rady School of Management. The full, 10-week course will launch in Spring 2017. While the program is primarily for engineers, students from across campus are welcome to apply. All of the student projects are unclassified and open to UC San Diego students of all nationalities. Students engage with their mentors during the pilot of Hacking for Defense. 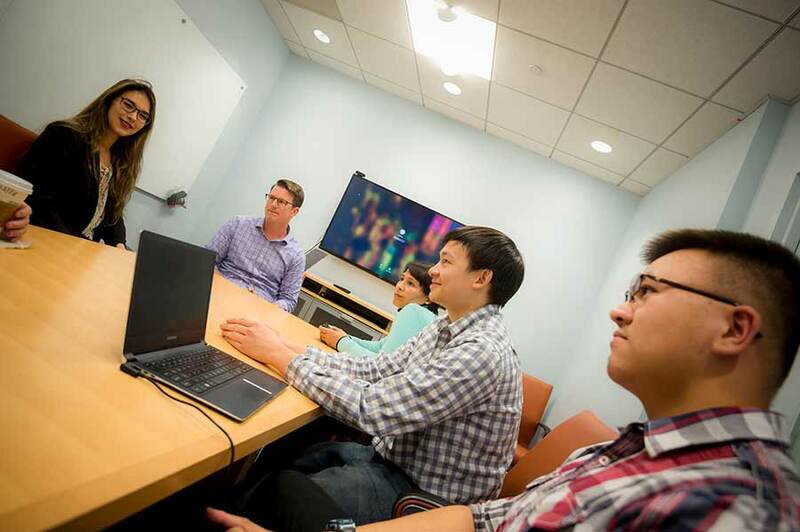 “This is not just a class, it’s the beginning of a way of thinking,” added Michael Krupp, Technology and Business Advisor at the UC San Diego Jacobs School of Engineering von Liebig Entrepreneurism Center. Raina Borum, for example, is a fourth year NanoEngineering student on the underwater swarms team who plans to go to graduate school. She says the class highlighted how her interest in nanomedicine might overlap with the needs of the defense community. Applications and solutions designed in Hacking for Defense classes could be viable in the private sector as well. When the class fully launches in April 2017, teams of UC San Diego students will work on eight problems sponsored by different branches of the military and the larger defense community. The student teams will get guidance from postdoctoral researchers or faculty members and at least one mentor from the military or defense community. The problems will range from preventing Department of Defense systems from cyber-attacks to biological warfare. The two problems for the pilot course were proposed by the Office of the Undersecretary of the Navy for Unmanned Systems. Additional guidance and subject matter expertise support was provided by the Naval Postgraduate School. At the end of the course, the organizations sponsoring the challenges have the opportunity to continue working with the students to develop their solution. Both teams from the pilot course will keep working with their sponsor to further their research and potentially productize their concepts. Members of the military and defense communities who would like to get involved in Hacking for Defense at UC San Diego should contact Michael Krupp at mnkrupp@gmail.com.